Atoll (Attol) is a slowly disappearing Goan sweet recipe. It is gluten-free. 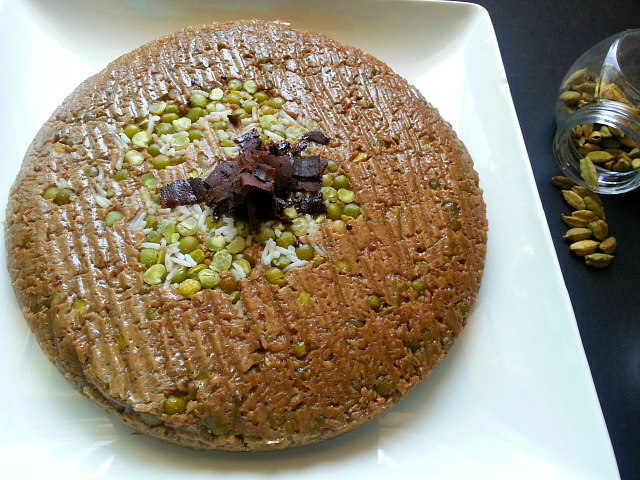 Made with rice, yellow channa dal, coconut and cardamom. We grew up eating a lot of homemade evening tea snacks and sweets in Goa. Some of them being Moong Dal Gorchem, Boiled Sweet Potatoes, Moong Dal Chunn, Alle Belle, Xiro, Banana Pancakes, Nankhatais, Baath, Pinaca, Patolios, Doce de Grao, Bolinhas de Coco and a few more. Many of the Goan recipes are gluten-free, Atoll is one of them. 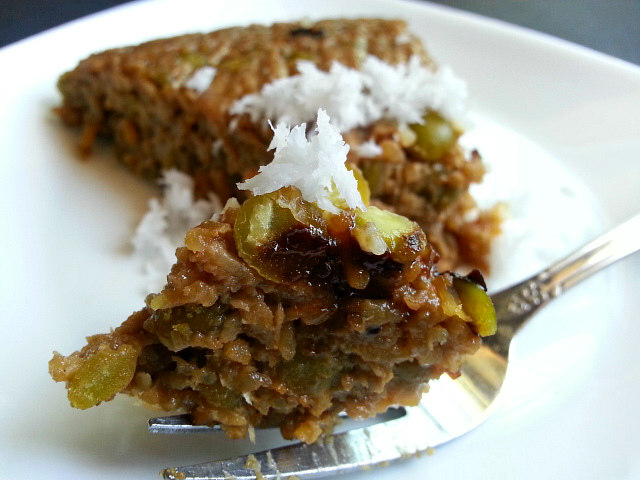 The Goan coconut jaggery plays an important role in many of the Goan sweets. It has a rich dark brown color and is made from coconut sap that is boiled down till hardened to form small triangular blocks. It melts very easily and soften to touch. It has the same amount of calories as regular sugar but has vitamin and minerals. Since it is not refined it’s a great alternative to regular white sugar. You can read more about the differences between the two here. Please note: For this recipe instead of yellow channa dal I have used split green peas (green pea dal) as it is readily available at the grocery stores in the US. I also had to replace a full freshly grated coconut with frozen grated coconut and coconut milk. 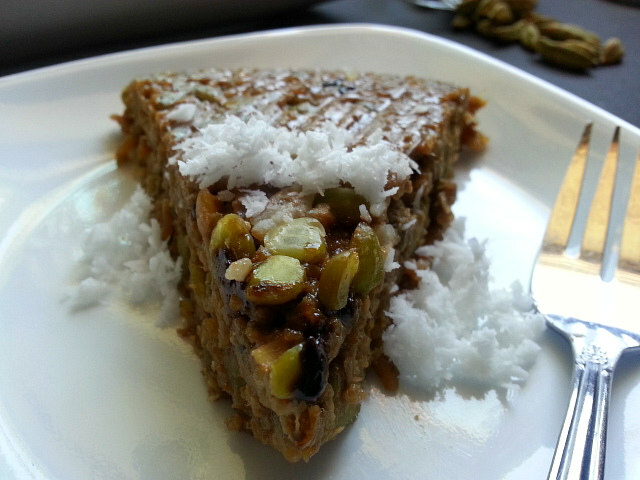 And finally if you do not have access to coconut jaggery than you can use regular jaggery or molasses. Cook the rice and dal as per instructions, once’s done in a pot add the cooked rice, dal and the remaining ingredients. 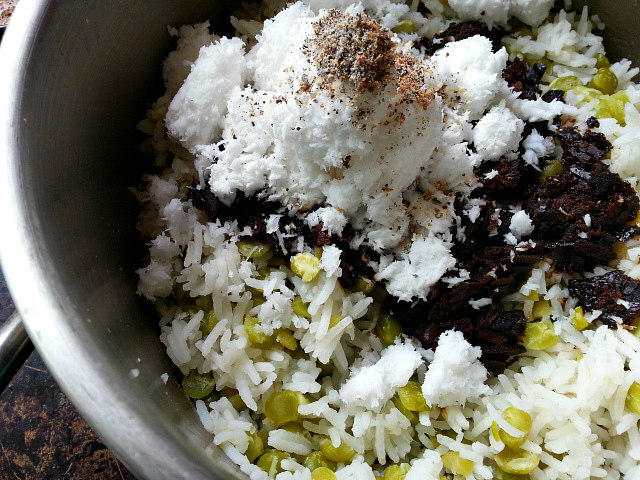 Keep stirring them together for 10-15 minutes on medium-low heat till the rice thickens like pudding. Transfer in a 9-inch spring-form pan and let cool and set for at-least 30-60 minutes. Slice and enjoy with your evening tea or as a dessert. You can refrigerate the rest for a couple of days. Just warm it up in the microwave for couple of seconds before serving. You can make another similar dish called as Orna which is made by soaking the rice overnight and ground into a paste and cooked to a pudding consistency. Then add the remaining ingredients and stir together for another 10 to 12 minutes till it thickens. I have friends in India, I have tried to learn dal’s and spices they use.. I would like to send them your recipe if you do not mind. It looks wonderful and they use channa Dal. I’ll have to note this recipe. We have gluten intolerant friends. I love learning about new dishes that I am not familiar with. I learned a lot from your post. Such interesting ingredients! It looks very flavorful. Love the look of it Nandini. Simply outstanding!! Cardamom is one of my faves, so I am always looking for a way to use it. Add in gluten-free for all the people around me who want it these days, and this is a great recipe! Your recipes are so interesting! I can’t wait to try your Rice and Channa Dal Pudding. The idea of rice for dessert has always intrigued me and your ingredients sound so fragrant and festive. I’m appreciating rice more and more these days. A Japanese friend once told me that if I wanted my rice to be stickier I should use medium grain rice. But lately, I haven’t been able to find it. So I’ve been enjoying jasmine rice instead. Your grandmother sounds like a person after my own heart. I have a degree in classical piano and hope that as I get older I will be able to continue to play as she did. How God loves for us to keep the gifts he’s given us alive! This looks totally delicious. I can’t get fresh or frozen grated coconut here. 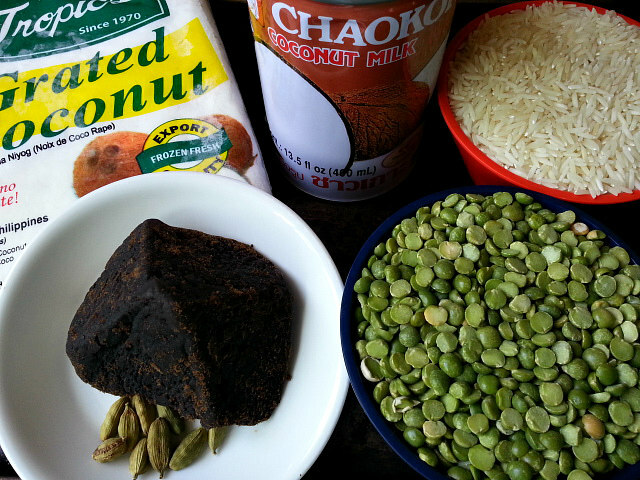 Could I use dried grated coconut? And maybe soak it for a while first? Cheers, Su. Thank You so much Su, It should work by soaking it in a little warm water. Thank you. I’m really keen to try this. Mouthwatering! Brings back some great memories of vacations in Goa. ATOLL is a cake little sweet which I had almost forgotten about.. I remember Me late Granny would talk about it. I think She used to prepare it in the house. But I don’t think I ever ate it, if I did eat it I don;t really remember how it tasted like. But all the same, thanks for reminding Us about this SWEET/DESSERT. Atoll is something I guess was made in every Goan household long before all the junk food was available in the shops in Goa.I think We will give it a go soon, just to celebrate Goan ATOLL, which otherwise will go out of fashion. I have already emailed this recipe to all My friends and family in the U.K and also to other parts of the world. It makes Us all feel NOSTALGIC as always. We had an additional holiday in the U.K, as it was bank holiday weekend. Thank you Mr Stan. It is a dying recipe. Something not found to often now a days in Goa. Looking back I feel that our elders were very wise in their cooking ways as a lot of the food of those times were much healthier and less complicated. And Thank you for sharing my post I appreciate it very much. Regards. Very interesting recipe! Looks really good! It continues to amaze me how versatile dals are as ingredients. Also, do you think Mexican piloncillo (unrefined cane sugar cooked down and shaped into a cone) might substitute for jaggery? You are right Darryl dal is used for both savory and sweets recipe. It sure is very versatile. The best part is that it has higher protein content and is gluten-free. Piloncillo is the same as the gloden jaggery we have in Indian cooking and is also made from the first boil of the sugar cane juice. Wow! Never had/seen this recipe before. Thanks a lot for sharing! This is such an interesting recipe! Something completely different…So easy to make, it must be delicious! Looks so pretty 🙂 I’m sure it tastes great too! It looks really good. The sugar substitute you used sounds very interesting. I’m going to look in my market for it and give it a try. Can one use it anywhere like white sugar? Thank you so much Deborah. You sure can use it as a sugar substitute but do keep in mind that it has a rich dark brown color like molasses. So it will work well for a chocolate cake but not for a pound/white cake. Looks tasty and healthy. Great food!